Today, while at work, my mother called me to let me know that the honey bees decided to swarm. 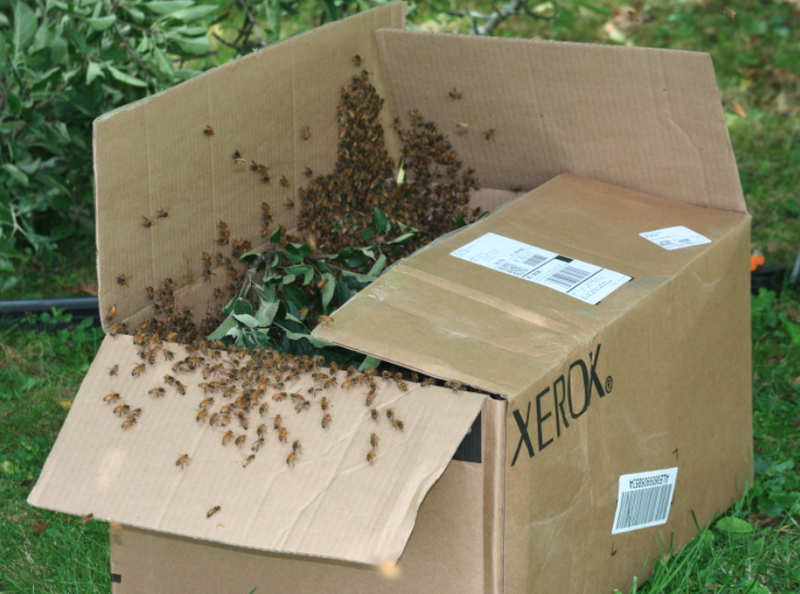 I left work and when I arrived home, I found that one swarm had already flown away never to “bee” found. The other swarm was still in the apple tree… a buzzing mass the size of two basketballs. 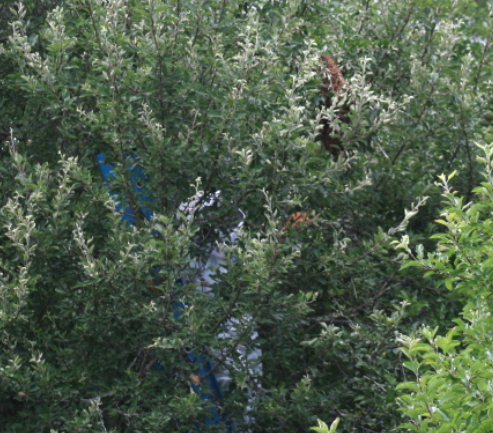 My older hives are only in their second summer, so I had never experienced swarming bees, and missed signs that would have probably alerted me that they intended to take flight. After rounding up some branch choppers, a ladder, and my bee suit, dad and I cut branches away until I was able to reach the swarm. The sound of buzzing bees was incredible as dad cut the final branch and thousands of bees dropped down into a cardboard box inches from my head. After letting them calm down, I was able to hive the bees in a makeshift hives constructed of some spare plywood and two honey supers. While hiving them I did see the queen with her red dot drop into the frames… hopefully she is still safely inside and will make her home in the new hive. This evening I consulted my books to read more about swarming. 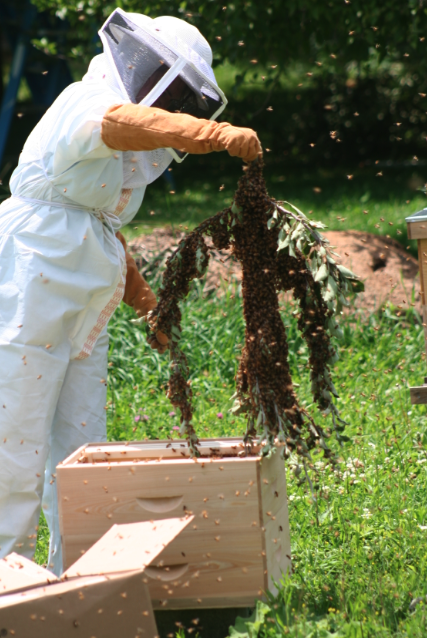 Things you should do to prevent swarming… avoid congestion, provide adequate ventilation, make the bees comfortable during hot weather, and remove queen swarm cells. I believe that my bees swarmed because of overcrowding. About a week ago I looked in my hives and noticed they had about two more frames to fill in the honey super… I had planned to add the second super this weekend; however, this was obviously wrong, as I should have added one immediately. Lesson learned. I will be watching my hives closely over the next couple of days to see how they fare. I am Yancy. I am a Trout fisher mostly. Sorry to read of the swarm issues. Personally, I have been swarmed before as well but I am not ready to talk about it. Hello, I too got swarmed recently, but by yellowjackets. I was weedeating and the nest was in the ground. Got me 10-15 bites and there were app. 100 yellowjackets flying defense patrols after. I am big. So it was a difficult experience. I recommend baking soda and water balm for the pain/swelling. Oh, no. Yellowjackets are no fun… I too got into some recently, while cleaning up some fallen down logs. My honeybees did not sting me once! Right before they swarm they eat lots and lots of honey, so they are feeling full and pretty calm (like how you feel after Thanksgiving dinner!) so they are easy to deal with!